Every cellular device Verizon Wireless sells in its stores goes through stringest testing in the company's lab. Basking Ridge, New Jersey (CNN) -- Verizon Wireless technicians have become intimately familiar with their much-lusted-after new phone from Apple. Verizon spent a year testing the carrier's debut iPhone model, which goes on sale next Thursday, said Verizon Communications COO Lowell McAdam. They've scrutinized aspects of the iPhone 4's design, cellular antenna, internet-sharing capabilities and other software. So when engineers ran out of things to evaluate and fine-tune, they turned their attention to features that customers won't have access to for some time. Take Apple's FaceTime video calling, for example. At first, Verizon's iPhone, like AT&T's, won't be able to initiate calls over a 3G wireless network connection, Apple spokeswoman Natalie Harrison said. But Verizon and Apple have already begun putting this feature through its paces, Verizon Wireless CTO David Small said in an interview at his company's headquarters. Apple left the door open for enabling FaceTime video calling over 3G starting this year, but the company hasn't set a launch date. Currently, an iPhone 4 can only activate FaceTime when connected to Wi-Fi. Harrison declined to comment on features that are being tested. For Verizon, knowing how extensively Apple's video-chat service taxes the network will be important when Apple finally turns on this ability. "My team and the Apple team have both been using that feature," Small said of FaceTime over 3G. "So that's all built into the data run rates that we're seeing out of these devices." All eyes will be on the nation's largest network when the carrier begins selling the world's most hyped cell phone next week. (It began taking pre-orders Thursday.) Here's a mark of confidence: Verizon Wireless will initially offer $30 unlimited data plans. 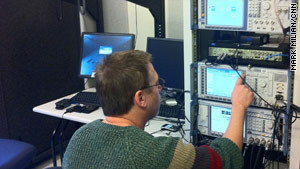 Verizon engineers test the key aspects of phones. In the room pictured, software checks a device's audio output. But Verizon's reputation has a lot to lose if its cell network buckles under the weight of heavy iPhone use the way AT&T has, analysts say. Verizon Wireless has heavily and successfully marketed itself as operating a reliable network. "If Verizon doesn't get it right," warned Forrester Research analyst Charles Golvin, "their brand is going to be hugely damaged." During this time of uncertainty, AT&T is trying to play up the advantages of its service. AT&T, the former exclusive iPhone carrier, has sent e-mails recently to some of its iPhone customers pointing out that Verizon iPhone users won't be able to access the Web while on a phone call. Representatives for the carrier are also contacting reporters with graphics touting the ability of AT&T phones to be used internationally. These are certainly noteworthy shortcomings of Verizon's infrastructure. But Verizon engineers have scrutinized every last detail of how the phone will work on their network, executives say. This will ensure that someone using an iPhone will be able to make and hold a call, or pull up Web pages without experiencing erratic outages, they say. Apple and Verizon have begun taking pre-orders in limited quantity from current Verizon subscribers. Soon, these handsets will begin shipping to homes, and Verizon will get to see the first batch of real-world usage that AT&T has struggled to accommodate for nearly four years. But Small, Verizon's technical chief, is confident he's not in for any surprises. "There are a large number of iPhones on our network today -- between us, from a testing perspective and (marketing) specialists, as well as some folks within Apple," Small said. "And we're seeing the usage patterns there." Along with future capabilities like FaceTime, Verizon has tested bandwidth-hogging applications, such as file transfers, video viewing and the Personal Hotspot feature. The latter is something that may initially be exclusive to Verizon, letting users broadcast a Wi-Fi connection from their iPhones so that laptops or other devices can get online for an additional charge. AT&T is evaluating that feature, a spokesman said, but he didn't return a request for comment about the progress on adding FaceTime calling over 3G. Verizon has been able to observe AT&T's missteps since the carrier activated tens of millions of iPhones. "When the 3G iPhone first hit, (AT&T) did their best to anticipate and model what the behavior would look like, but they had no clue," Forrester's Golvin said. "Verizon has quite a clue." Since then, Verizon has gotten customers to kick the tires on its network with the high-profile launch of its Droid smartphone line. "When we launched the Android operating system," Small said, "we saw a significant jump in data consumption. We also knew we were going to see a significant jump. ... So we got ahead of that forecast. And as a result of that, our network didn't blink, didn't miss a beat." Last year, in anticipation of the iPhone launch, Verizon completed "a significant portion" of the work to fortify its network that engineers had originally planned to do this year, Small said. That has given the network three to six months of cushion under anticipated growth patterns, Small said -- meaning that even if Verizon technicians went on a long spring break, the network should still hold up fine. Initial demand will be huge, analysts say. In its earnings report, Verizon cited 11 million as Wall Street's consensus estimate for how many iPhones it may sell this year. Verizon sees those purchases coming from its own existing smartphone customers, defections from AT&T, and people waiting to make the leap to smarter cell phones, Walden said. Golvin, the analyst, disagrees on the latter segment, but predicts a huge opportunity to lure away customers from smaller networks operated by Sprint Nextel and T-Mobile USA. Small, from Verizon, avoided naming specific competitors in much of the interview, but he did say in response to a question about AT&T: "We're not going to let what happened to someone else with their network happen to us." "I wouldn't mislead and say we're not concerned," Small added. "But we know exactly what the experience is and the impact of those devices on the network." CNN was given a tour of the Verizon Wireless device testing lab, located a few miles from the company's main headquarters. There, phones go through an extensive series of exams, spanning several rooms, and are scored based on their performances. The lab checks critical aspects such as a gadget's compliance with Verizon's cell routers and battery safety, along with more nuanced benchmarks such as how the earpiece and speakerphone sound. Manufacturers are frequently asked to tweak software settings or repair problems with a phone's innards, said Mitch Reidinger, Verizon's network manager. No device has ever been approved on its first run through the lab, he said. The iPhone was no exception. The current iPhone 4 models made for AT&T and 184 other carriers worldwide have a major weakness, at least for some users: the antenna. But Verizon says don't anticipate seeing another "antennagate," the hardware design flaw that caused the AT&T iPhone to lose signal when held a certain way. During Verizon's announcement, Apple COO Tim Cook said the antenna is "going to work great," deflecting a question about whether the phone maker had addressed the problem. Verizon's Small said the issue that plagues current iPhone 4 units would not have passed his carrier's testing. "We have a very stringent design criteria for our antennas," Small said. "You won't see any antenna issues with this device."